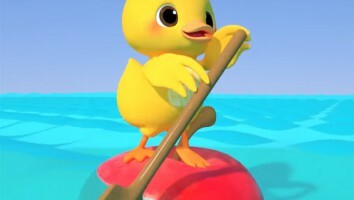 Tubular Labs data shows ABCkidTV – Nursey Rhymes (pictured) bested Ryan ToysReview and dominated digital viewing time among kids last month. 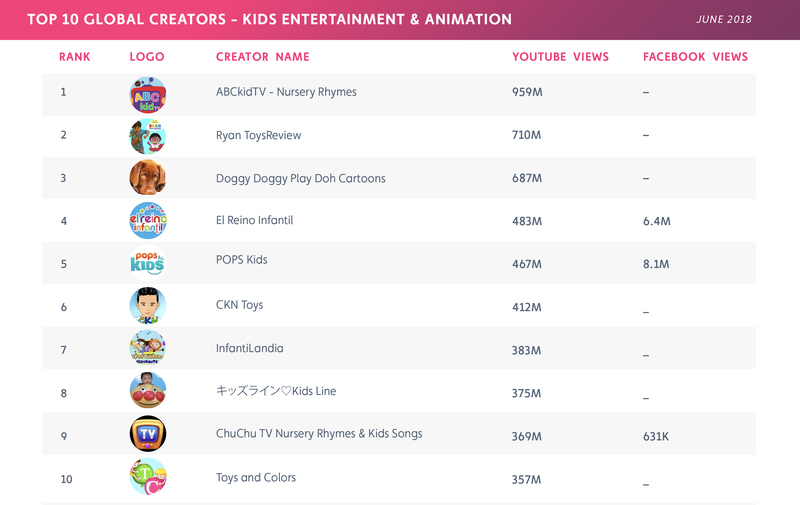 Ending Ryan ToysReview’s months-long reign, new data from California’s Tubular Labs shows that ABCkidTV–Nursery Rhymes is the leading overall creator in the global kids space, with 959 million views on YouTube in June. The channel’s YouTube views grew 27% in June, and its followers and subscribers growth increased by 39%. 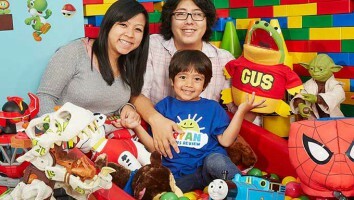 Ryan ToysReview previously led the category in May (with 801 million views), April (with 876 million views), March (with 858 million views) and February (with 898 million views). In June, the YouTube channel’s views fell 11%, though its followers and subscribers growth increased 18%. However the popular channel is not far behind, still coming in second this past month, with 710 million YouTube views. In third place, Doggy Doggy Play Doh Cartoons had 687 million YouTube views in June. The channel didn’t appear on Tubular’s list in May, but its views in June grew by 124% compared to the month before. Additionally, Doggy Doggy Play Doh Cartoons’ followers and subscribers growth increased by 142% in the same period. Rounding out the top five were El Reino Infantil with 483 million views and POPS Kids with 467 million views. 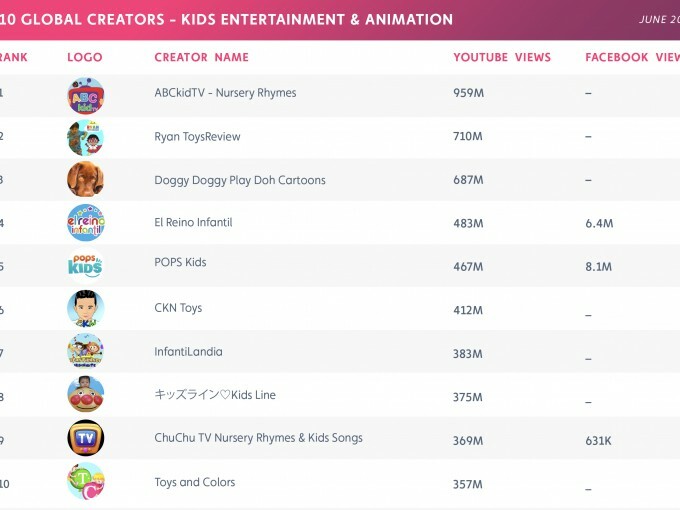 The rest of the top ten was made up of CKN Toys (412 million views), InfantiLandia (383 million), Kids Line (375 million), ChuChu TV Nursery Rhymes & Kids Songs (369 million) and Toys and Colors (357 million). Kids under the age of 13 are legally restricted from using Facebook, but Tubular Labs measures video views on the social network for a number of kid-centric content creators. 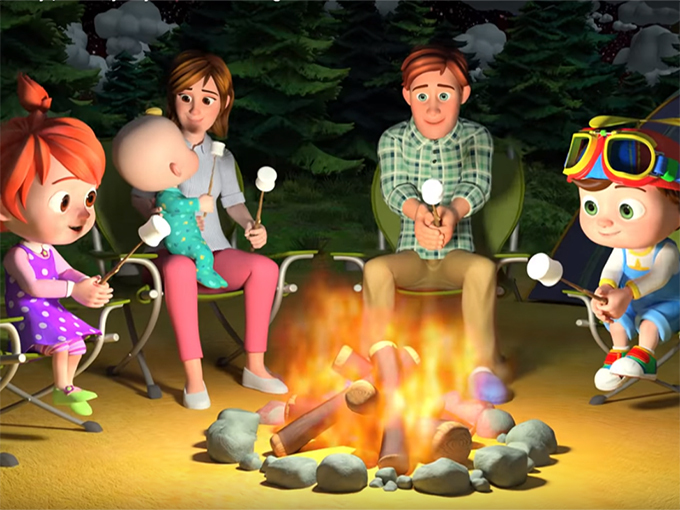 In June, POPS Kids took the top spot with 8.1 million views on Facebook, followed by El Reino Infantil (6.4 million) and ChuChu TV Nursery Rhymes & Kids Songs (631,000).